Fraser came to Underground Graphics to complete the look on his heavily modified Toyota Yaris. With the engine and interior already sorted the only thing remaining was to complete the bodywork. Inspired by Need For Speed Underground Fraser came to the office armed with ideas and prints straight from the game. Wrapping body panels with vinyl is difficult when they are not flat or gently curved so you'd think a full bumper is out of the question. Not always as Vehicle Conform vinyl is very pliable, handy seeing as it's sold specifically to wrap vehicles in. Sadly in this case the limited number of colours available meant Fraser had to come up with another plan - matching paint to the stock red vinyl we were using on the rest of the car. 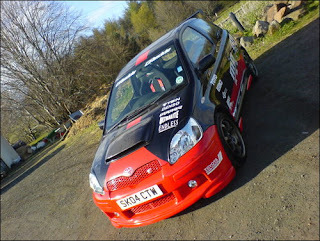 A call to Andy at the Bodyworx in Paisley, who comes highly recommended having done a stunning job with Doug's Nissan Skyline, our Official 2005 Show Car, meant we were free to get on with the job and Fraser had the bright red bumper sorted. The rest of the design flows nicely with the lines on the car - single wide stripe coming off the back of the huge bonnet scoop, over the bonnet, roof and down the boot. Red angled stripe along the bottom of the doors tying the bumper in to the rear of the car and the curves at the ends of the sideskirts wrapped in red. Some performance logos finish the design off keeping the car very tidy without going over the top.